Kate Moross has built a career on versatility. From graphic design and animation, to typography and illustration, she brings color and originality to every project – and the new Journal collaboration with MOO is no exception. 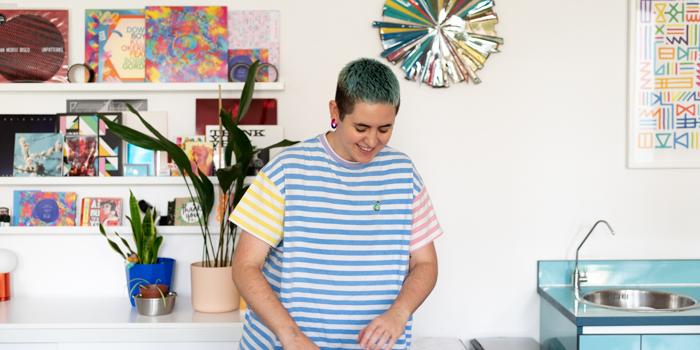 Starting out as a designer on the London music scene, Kate Moross now runs a studio in the city, working with global names, including Disney, Uniqlo and Kiehl’s. She isn’t afraid to do things differently – and has maintained a bold aesthetic and attitude throughout the journey from solo-designer to studio-boss. MOO talks to Kate about the small steps the studio has taken to reach success, the importance of designers giving something back, and the colorful new Journal collaboration. I studied graphic design at the University of the Arts, London (UAL), and in my early 20s would hang out at clubs and gigs. I experimented with making flyers and posters for the indie music scene, and eventually started getting paid. Almost without realizing it, design became my job. Over time, I became hungry for more span in my work, trying things like video, animation and art direction. In 2012, I was sharing a studio space, but while I loved the atmosphere, my peers weren’t very open to projects that sat outside their perception of coolness. In contrast, I love working on a brand that’s not so cool – to me, that’s much more of a challenge. I realized I had to look for like-minded people, so I made my first full-time hire – Oliver, a graphic designer who’s still with us – then bought some Business Cards and launched a website. I guess color is my brand. Why be boring? Why be the same as everyone else? That’s the message I tell myself all the time. In the West, everything’s becoming the same – there’s a homogenization of fashion, design, art and music, and everyone’s consuming the same products, wearing the same clothes and desiring the same aesthetics. For me, cool isn’t about being trendy – it’s about self-expression and a lack of self consciousness about what other people think. I don’t want to follow what everyone else is doing, I want to do things my own way. I love travelling – trying different foods, seeing different cultures and hearing people’s views on their own sociology. I believe the world is far more interesting when everyone is different and expresses their true self, whatever that may be, so I like to express myself as much as possible, visually as well as in what I say and in the work that I create. The idea is that once you’ve finished with the books, they’ll sit together in their case on a shelf as a kind of time capsule of the project you worked on at that particular moment. I hope people enjoy them – they’re quite tactile and colorful, and different to what you’d usually see in a meeting, so they’re a bit of a conversation starter as well. I had to really hustle to take on more design and art direction work, because I was known as an illustrator. At the time, people weren’t so aware of people who are multi-disciplinary – they’d think, “Oh, Kate’s a letterer.” But I also do everything else. I’m still pushing the vision of how creatives are perceived, and fighting the world from the generalist point of view. I want to show people you can be OK at lots of things – you don’t have to be amazing at one thing, or at everything. There’s value in understanding and approaching lots of different media and types of work, and it doesn’t mean your work is less valid. Although I’m part of the LGBTQ+ community and want to represent them in my work, I’ve turned down campaigns when I haven’t agreed with the approach. I don’t want to be part of a rainbow capitalist movement. And although visibility is important to me, I don’t want to be tokenized, fetishised or positioned by someone else. Back in the day, before Instagram, the creator wasn’t part of the conversation. You were just the hired hand, and had the choice to be invisible. Now, if you write or create something, you’re responsible for the message too, so I have to be careful with how my voice is put out there. Luckily, I’ve always had a robust filter for the kind of work I do, so there’s nothing I regret doing. Starting a business is one of the most rewarding, yet most difficult things I’ve ever done. I’ve had amazing support from family members who work in business, but a lot of it has been instinctual and a natural part of my personality. A lot of what I do is trying to make sure we operate in a way that’s fair and good – that’s my constant project. Draw it. Write it. Do it. Inside the pink slipcase you’ll find everything you need to develop your creative projects, from first scribblings to final plans.